Lincoln Electric Camo flame resistant welding jacket. Features 9oz flame retardant cotton, heavy duty snap fitting buttons, and an inside inner pocket for storage. Medium size. A great complement to the welder with a helmet and beanie for more complete protection. This Lincoln Electric product has been developed exclusively for the Canadian market. Fleetweld 180 (6011) offers excellent arc stability for excellent performance with power sources as low as 50V open-circuit voltage (OCV). An all-position electrode, particularly good for vertical up and overhead welding. Fleetweld 180 is a great choice to use for dirty, painted, or greasy material. It offers deep penetration and light slag. Fleetweld 180 (E6011) is an excellent choice for small AC welders. The flux-cored nozzle is used to protect the threads and openings of the gas diffuser/contact tip holder during the flux-cored welding process. The flux-cored nozzle also insulates the operator from the electrical circuit. Damaged or missing nozzles should be replaced immediately. Here is a terrific all-position electrode for low amperage welding on sheet metal - especially in applications where appearance is important. The Fleetweld 37 (E6013) stick electrode performs beautifully with smaller AC welders with low open-circuit voltages. It is an excellent choice for jobs involving irregular or short welds that require a change in position. With easy to remove slag and good appearance, this electrode performs beautifully on AC or DC welding output. AC? DC? This electrode performs beautifully either way! This electrode is a great choice for low open circuit voltage AC power sources. Cold restrikes are no problem with this versatile, all-position electrode. 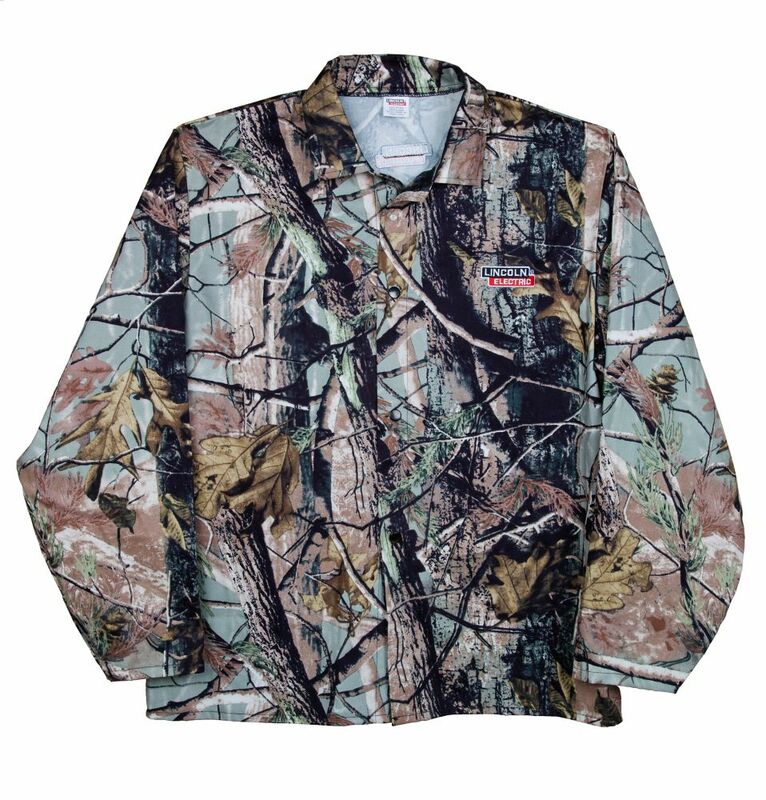 FR camo welding jacket Lincoln Electric Camo flame resistant welding jacket. Features 9oz flame retardant cotton, heavy duty snap fitting buttons, and an inside inner pocket for storage. Medium size. A great complement to the welder with a helmet and beanie for more complete protection. This Lincoln Electric product has been developed exclusively for the Canadian market.